Israel and the United States are poised to collaborate more closely on cybersecurity research and development as lawmakers passed two bills that aim to strengthen the collaboration between the nations. The US House of Representatives on Tuesday unanimously passed legislation introduced by Reps. John Ratcliffe of Texas and Jim Langevin of Rhode Island. The bills, the United States-Israel Advanced Research Partnership Act of 2016 and the United States-Israel Cybersecurity Cooperation Enhancement Act of 2016, now await action in the Senate. “Israel is a vital strategic partner, and I’m pleased to be working closely with Rep. Langevin to preserve and strengthen this important bond through joint cybersecurity efforts. Cybersecurity is national security, and enhancing joint research and development efforts between the United States and Israel will improve our countries’ ability to deter malicious cyber actors,” said Ratcliffe, who chairs the House Homeland Security Subcommittee on Cybersecurity, Infrastructure Protection and Security Technologies. Collaboration between nations is believed by industry experts to be one of the best ways to prevent the growing threat of cyber-attacks, and there is a critical need for countries across the world to share research and development and innovations. Increasing mobile and web usage and social media are among the key factors contributing to the “explosive increase” in cyber threats, MarketsandMarkets, a Dallas, Texas-based market research firm said in a report. The global cybersecurity market will be worth more than $170 billion by 2020, according to an estimate by MarketsandMarkets, with companies globally focusing on security solutions but also services. “I’m glad the House passed these bills to amplify the work already being done to tackle the growing cyber threats we both face, and I’m hopeful this legislation will serve as a solid foundation for a sustained cybersecurity partnership as we look to address new and evolving cyber issues moving forward,” Ratcliff said. “My trip to Israel with Congressman Ratcliffe was an illuminating experience, and reinforced my belief that our countries have much to learn from one another when it comes to cybersecurity,” said Langevin, co-founder and co-chair of the Congressional Cybersecurity Caucus. The United States-Israel Advanced Research Partnership Act expands a binational research and development program at the Homeland Security Advanced Research Projects Agency to include cybersecurity technologies. This collaboration between the Department of Homeland Security and the Israeli Ministry of Public Security helps new products pass through the so-called “valley of death” — the period between basic and early-phase applied research through to successful commercialization. It will help both countries develop solutions to the unique security problems found in the cyber domain, according to a statement issued by Ratcliffe. The United States-Israel Cybersecurity Cooperation Enhancement Act will create a cybersecurity grant program for joint research and development ventures between Israeli and US entities. The Secretary of Homeland Security will determine research requirements with help from an advisory board made up of members from US-Israeli partnerships, such as the United States-Israel Binational Science Foundation and the United States-Israel Binational Industrial Research and Development Foundation. The compromise, which envisions spending $6.3 billion over the next decade, was condemned by consumer groups and some Democrats as a present to drug makers that promised only paltry spending increases for underfunded federal programs. WASHINGTON — The House easily approved a sweeping biomedical bill Wednesday that would help drug and medical device companies win swifter government approval of their products, boost disease research and drug-abuse spending and revamp federal mental health programs. But their objections were overwhelmed by an alliance among Republicans, many Democrats and the White House for a 996-page measure that bore wins for both parties. The Senate’s expected final approval next week would mark an uncommon episode of cooperation between the GOP-run 114th Congress — which plans to adjourn next week — and President Barack Obama in their dwindling days in office. 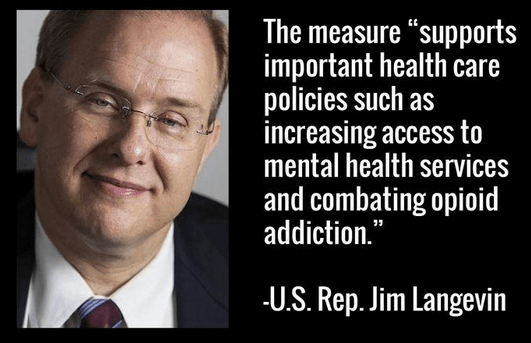 Rhode Island Reps. Jim Langevin and David Cicilline, both Democrats, voted to approve the measure. “The 21st Century Cures Act makes crucial investments in innovation and medical research, including the Cancer Moonshot and BRAIN Initiatives, and it supports important health care policies such as increasing access to mental health services and combating opioid addiction,” Langevin said. But he added: “… the 21st Century Cures Act is by no means a perfect bill. It strips away funding from the Public Health Prevention Fund, undermining our efforts to fight the very diseases we are attempting to cure. And although this legislation streamlines the FDA drug and device approval process, we must ensure that these reforms do not compromise patient safety. Democratic hopes — and leverage — for winning more money and consumer protections faded with Republican Donald Trump’s presidential election triumph. Senate Majority Leader Mitch McConnell, R-Ky., flatly said his chamber will send the measure to Obama, and Durbin said he expected Senate passage. In a written statement, White House spokesman Josh Earnest said the bill “is not perfect” but contains “advances in health that far outweigh these concerns.” He said the Senate should approve it quickly. The bill includes an additional $4.8 billion over the next 10 years for the National Institutes of Health. The medical research agency spends around $32 billion annually, and supporters complain that spending cuts imposed by Congress and rising research costs mean its budget has eroded in value since the early 2000s. “A couple billion dollars doesn’t go very far in cancer research” over 10 years, said Lisa Plymate, a director of the liberal-leaning National Physicians Alliance. Much of the NIH money would be for Obama’s precision medicine initiative, aimed at tailoring drugs for people’s genes and lifestyles, and research on cancer, a focus of Vice President Joe Biden, whose son Beau died of the disease in 2015. The Food and Drug Administration would get $500 million to streamline approval processes for drugs and medical devices. States would get $1 billion over the next two years for preventing and treating abuse of addictive drugs like opioids, a problem that is surging in GOP and Democratic represented communities around the country. Rhode Island preschool programs will receive $6 million from the U.S. Departments of Education and Health and Human Services through the Preschool Development Grant Program. Rhode Island is one of 18 states awarded funds to expand access to preschool for children from low-to moderate-income families. The announcement was made in a joint news release from U.S. Senators Jack Reed and Sheldon Whitehouse, and Congressmen Jim Langevin and David Cicilline. Four New England states are among 18 states getting more than $247 million in federal grants to continue expanding access to high-quality preschool for children from low- to moderate-income families. The share of the funds announced Wednesday also included $15 million for Massachusetts, $11.7 million for Connecticut and $7.3 million for Vermont. Democratic U.S. Sen. Jack Reed says Rhode Island’s congressional delegation stood firm and staved off the elimination of funding for the preschool development grants. Rhode Island is one of six states and the only one in New England that federal education officials say met or exceeded enrollment targets. NORTH KINGSTOWN — Boy Scout Troop 147 North Kingstown awarded Eagle Scout honors, the highest rank in Scouting, to four young men from North Kingstown Saturday at an Eagle Court of Honor held at St. Francis de Sales Church. 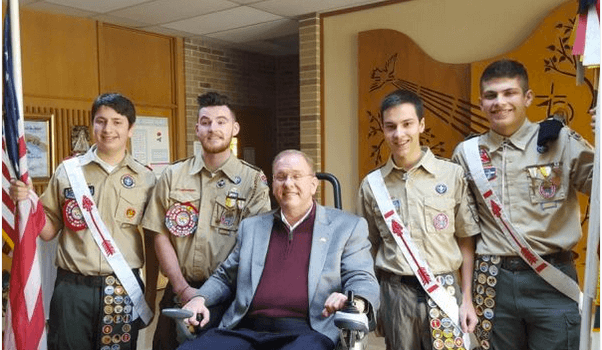 Nicolas Berg, Jacob Cotter, Jeffrey Dowling and Christopher Santos were recognized by the Troop, their family and friends, and local dignitaries including Congressman Jim Langevin, state Representative-elect Julie Casimiro and Town Council member Kevin Maloney. Langevin noted the leadership skills the four young men learned in their years in Scouting, and entreated them to use what they’ve learned to make the world a better place. “We need you,” he told them. The Congressman also acknowledged Jacob Cotter’s maternal grandfather, Martin Reinsel, who became an Eagle Scout in 1947. Scoutmaster Philip Gambrel lead the ceremony, which featured citations from all the living U.S. presidents and other leaders. Former Scoutmaster Doug Smith created a video presentation of the boys’ seven years in Scouts. Nicolas Berg is a senior at Bishop Hendricken High School who is seeking acceptance at Harvard University. Jacob Cotter, a 2016 graduate of North Kingstown High School, is a freshman at Rhode Island College. Jeffrey Dowling is a 2016 graduate of North Kingstown High School. Christopher Santos is a 2016 graduate of North Kingstown High School and a cashier at Dave’s Marketplace Quonset. Eagle Scout is the highest achievement rank in Boy Scouting. Since 1912 more than 2 million Boy Scouts have earned the Eagle Scout rank. In the words of the Eagle Scout Promise, Eagles to their best each day to make their training an example, their rank and their influence count strongly for better citizenship in the their troop, in their community, and in their contacts with other people. To this they pledge their sacred honor. Tomorrow, families all over the country will come together to enjoy a meal and each other’s company. We will put our differences aside and focus on what really matters. We will celebrate what is good in the world, and give thanks for the blessings in our lives. It is a day to remember how fortunate we are to live in this country, and it is a day when I reflect on just how fortunate I am to have friends like you. I’ve said it before, but I think it bears repeating that you are the reason I am returning to Congress. Your support and friendship has meant the world to me, and this Thanksgiving, I am feeling especially thankful for you. I cannot thank you enough. I hope you have a wonderful day tomorrow with your loved ones, and that it is just the beginning of a joyous holiday season. EAST PROVIDENCE, R.I. (WPRI) — Rhode Island Congressman David Cicilline and other Democrats are increasing calls for President-elect Donald Trump to drop former Breitbart CEO Steve Bannon, whom Trump named as White House Chief Strategist. Bannon has come under fire for Breitbart’s ties to the “Alt-Right” movement and it’s purported links to white nationalism. Cicilline’s office says more than 100 of his colleagues have signed the letter. 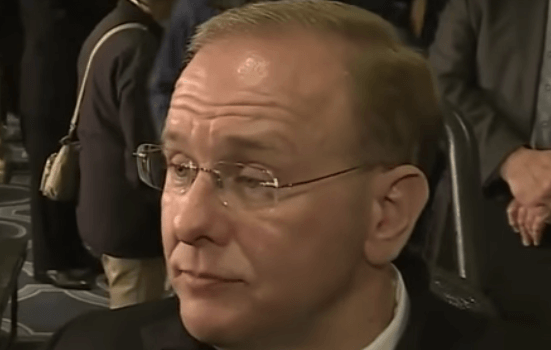 Among them was Congressman Jim Langevin, who released a statement on Wednesday. “My office has been absolutely flooded with phone calls, emails, and social media comments from constituents who are rightfully afraid of the influence that Bannon could potentially have on public policy in this administration. While the President-elect has the right to surround himself with the advisers of his choice, I believe this appointment sends a dangerous message to the American people,” said Langevin. “I have always tried to work in a bipartisan way, and I am ready to work with the incoming administration, as well, but I am not willing to do so at the expense of common decency. On Tuesday afternoon, Senate Democrats said in a news conference that elevating Bannon to a top White House post undermines Trump’s claims that he wants to unite the country. Members of Trump’s staff have defended Bannon, denying claims that he is prejudiced. Unlike cabinet positions, Trump’s picks for his White House Staff do not require congressional approval. 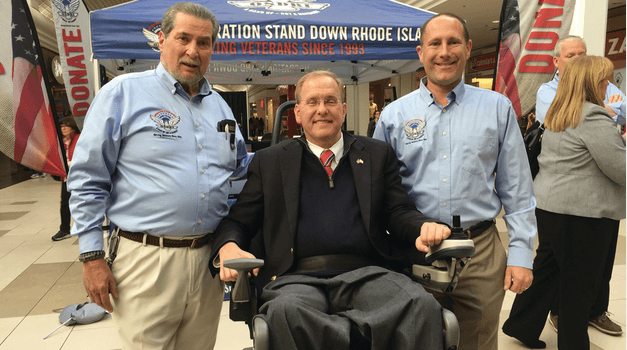 “There is no better way to say thank you to a veteran than actually giving them a hand that they need,” said Dee DeQuattro, Director of Communications for Operation Stand Down Rhode Island. On Friday, the organization did just that by hosting a resource fair at Warwick Mall. Governor Gina Raimondo, Senators Sheldon Whitehouse and Jack Reed and Representative Jim Langevin were among the leaders who visited the fair where veterans and their families could learn about their options for housing, employment, training and supportive services. OSDRI is a nonprofit handling the issues of veteran homelessness, housing, employment, benefit coordination and has four food pantries across the state. The first issue is one that is particularly prevalent. According to OSDRI despite the “Zero 2016” campaign that aimed to end veteran homelessness by 2016 and the Rhode Island Coalition for the Homeless’s announcement that veteran homelessness in the state was nearly over, the issue is still “rampant.” In fact, OSDRI said it has witnessed an increasing number of homeless veterans seeking services. Since the announcement was made last November, OSDRI has housed more than 300 veterans through its various programs, and the list of chronically homeless veterans maintained by the State Continuum of Care and RI Homeless Coalition has almost doubled, the organization said in a release. Since October 2015, OSDRI has helped 191 homeless veterans get into their own permanent housing and assisted another 102 veterans who were on the verge of eviction keep their housing. Additionally, the organization houses 88 veterans and their families in its own supportive housing located across the state, 20 of which were placed just this year. “While it might have been a great photo op to declare victory last year, those of us who work in veterans services know that the fight is far from over. This year alone the number of homeless veterans continues to rise,” said OSDRI Executive Director Erik Wallin. Dee DeQuattro said Friday’s event aimed to reach out to a broad spectrum of veterans. She said OSDRI coordinated with the likes of the VA and the state to put on the fair. The event they hope to host annually was a huge success, bringing in “tons” of veterans all day, she said. Langevin said he was glad OSDRI was making resources accessible to veterans. “I’m grateful for the work Operation Stand Down is doing. It’s a nice way to honor our veterans by making sure we’re honoring our promises to them,” Langevin said. Also in attendance was Director of Veterans Affairs Kasim Yarn, who heads the Office of Veterans Affairs that opened in September. DeQuattro said OSDRI advocated for the new office and that the two refer people back and forth between them often. Yarn said the new Jefferson Boulevard office is doing “awesome” and sees approximately 10 veterans a day. Yarn and Raimondo also discussed their hopes and anticipations for Rhode Island veterans under the upcoming presidency. “President-elect Trump has expressed in the campaign admiration for veterans, and I hope that he will demonstrate that admiration through providing us funding and support for the work we’re doing for our veterans here in Rhode Island,” she said. 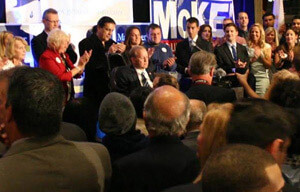 Langevin is a founder and a co-chair of the Bipartisan Disabilities Caucus, an organization where a group of individuals come together and discuss the issues in the people with disability community. In 2015, he contributed to the FAST Act, a transportation bill that would promote the transit system to make trains more accessible for individuals with disabilities. The bill would allow people with disabilities to gain more opportunities because of the accessible transit system. 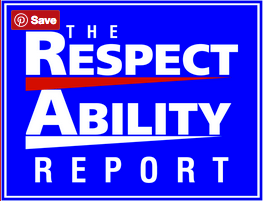 Other priorities include having access to community services and supports; removing obstacles to health and wealth; encouraging employment opportunities for people with disabilities; and having a full implementation of the American with Disabilities Act. ANSWER: Yes. As co-chair of both the Bipartisan Disabilities Caucus and the Congressional Career and Technical Education Caucus, I have a unique perspective on the intersection of policies that will provide employment opportunities for people with disabilities across a variety of sectors. I supported passage of the Workforce Innovation and Opportunity Act of 2014, which took some important first steps toward encouraging integrated employment opportunities, and I am currently working to reauthorize the Carl D. Perkins Career and Technical Education Act, with a goal of being even more inclusive of students with disabilities so they can participate in the experiential learning process that is so important in today’s economy. I am also a sponsor of a resolution supporting the inclusion of Art into STEM education, transforming STEM to STEAM for students of all abilities. 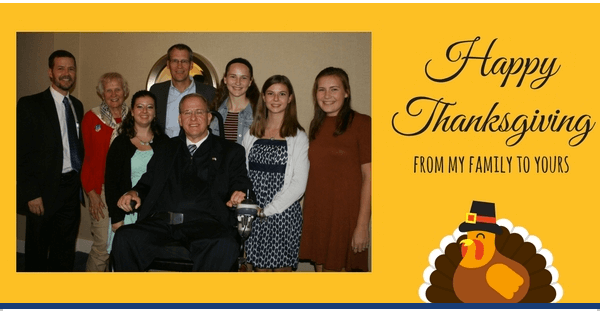 Congressman Jim Langevin released a statement on Wednesday following the election of Donald Trump as the 45th President of the United States. “I want to thank Hillary Clinton for her lifetime of service to this country. As a First Lady, as a U.S. Senator, as Secretary of State, and as a candidate for President, she has been the ultimate public servant and I remain so proud to support her. Her vision for our nation is one that I share, and as I return to Washington, I will remember the ideals and values she fought for, and do my best to carry that torch in Congress. While this is clearly not the outcome I had hoped for, if Hillary has taught us one thing, it’s that we should never give up and never stop fighting for what is right. Now, more than ever, we need people in government and in our communities who will champion progressive causes and represent the voices of the marginalized. There are many Americans waking up today feeling disappointment and fear; people who are unsure of where they fit in. Let us remind them – remind every American – that this is where they fit in. The United States is still the land of hope and opportunity, and we must each do our part to heal the wounds we felt so deeply in this election cycle.